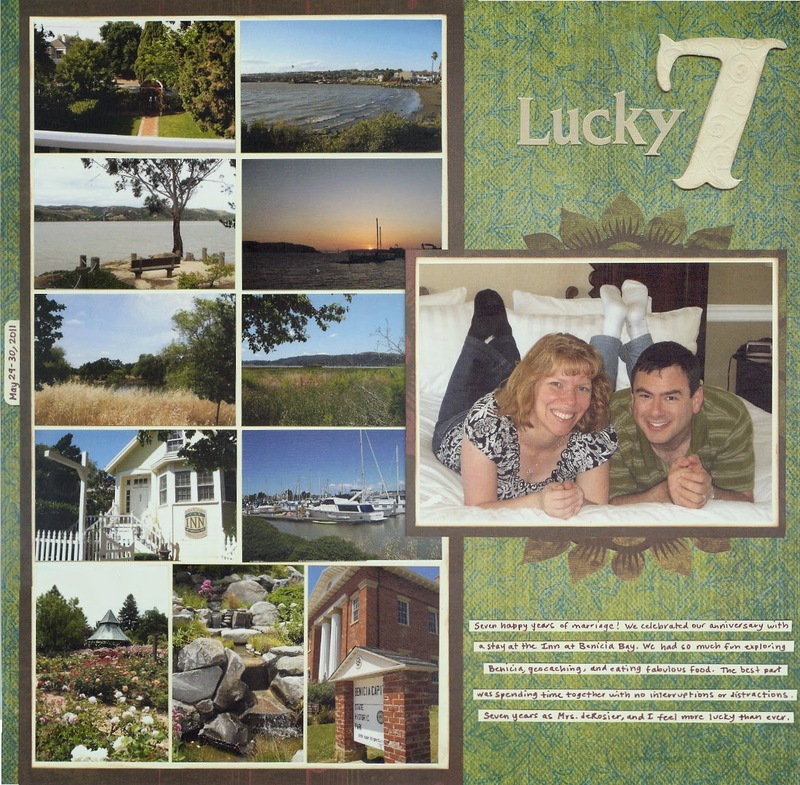 Tomorrow, Steve and I are celebrating our 11th anniversary. We're headed to Half Moon Bay. Grandma will stay here with Trevor and Trouble. I can't wait. Steve and I are staying at a beautiful inn on the beach, with plans for leisurely meals, long walks, geocaching, movies, and board games. But the first thing we'll do after checking in is to pose for our annual anniversary photo together. Starting with our 5th anniversary, we have used the GorillaPod and the self-timer to take a picture of us on the bed. These are some of my absolute favorite layouts. They represent so many fun adventures. Thanks to Steve for eleven fantastic years. I love you! Happy anniversary! New-to-me food #16 was actually a gift to Steve and me from his sister's travels. It was a metal can, the size and shape of a tuna can. Unlike tuna, whatever was inside sloshed like a liquid. The label was entirely in German. 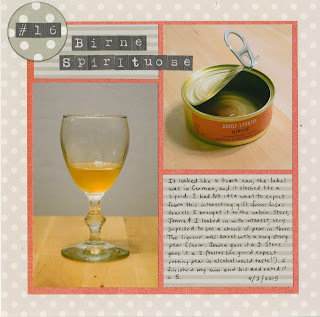 I recognize about 20 words in German, including birne (pear). It turned out that the can held pear liqueur. We opened it on the first night of our Easter trip to Bear Valley. The liquid was a beautiful gold color and there was a single cube of pear in the can. It smelled strongly of pear. To call these "flaky" was a bit like calling water wet. This odd dessert was essentially a big stack of flakes balanced on top of each other. How on earth they took the gorgeous photo on the box is a complete mystery to me. It was very tricky getting them out of the package even partially intact. Most of us ate ours with a spoon because it simply wouldn't hold together into the finger food we'd assumed it would be. However, despite flaking into a pile that looked not unlike fish food, the soan papdi was DELICIOUS. 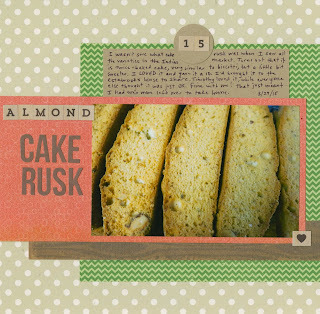 It was sweet, but not too sweet, with the perfect amount of almond and pistachio flavor, with just a hint of cardamom. It literally melts in your mouth. Three of us gave it a 9, one an 8 and one a perfect 10. This weekend was the 4th anniversary of my goddaughters' baptisms. I like to give them a little special something each year for the occasion. I made some simple flower cards this time. I started with embossed blue cardstock, added three Prima flowers, cut leaves from green cardstock and tucked them under the flowers, and added the paper embellishments to the centers of each flower. Quick and easy! Inside, I tucked a few dollars with instructions to buy something beautiful for their garden. My hope is that as their chosen plant blooms and grows, they'll be reminded of their baptism and their lifelong growth as children of God. The story of today's layout goes back to 2011, when I was preparing for my 40 Things During My 40th Year project. I had started compiling my list of potential new-to-me items and learned about Big Red Soda on a Food Network show. Actually, they'd covered the name on the label and given it a vague, generic name, but I was able to suss out what the product actually was with a quick Google search. I was intrigued. 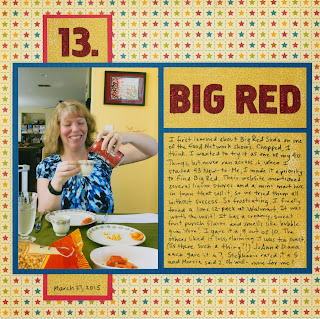 During the course of my 40 Things project, I kept hoping to run across Big Red somewhere so I could try it. It didn't happen. It was one of a handful of new-to-me activities, locations, and foods that remained on my to-do list after the project ended. Therefore, when it was time to start 43 New-to-Me, Big Red jumped to the top of my list. 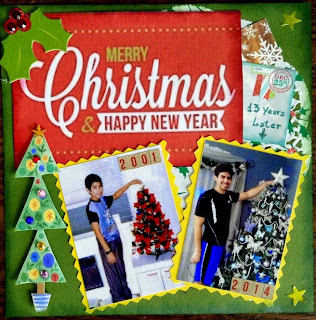 While I hadn't gone out of my way to find it in 2012, I was going to do whatever it took to find it in 2015. I used the website's FIND feature and discovered that there were actually a lot of stores in my area that carried Big Red.... and 99% of them were either somewhat-sketchy or extremely-sketchy liquor stores. The next day while Trevor was at school, Steve took an early lunch to go with me to the least-sketchy of the liquor stores. My hope had been that by going to a liquor store at 10:00 am on a weekday, we'd have the place to ourselves. Sadly, not so. But we were the only ones in the soda section of the liquor store! We went to 3 places on the list and not a single one had Big Red. It was extremely disappointing, though all was not lost, as the gas station mini mart we visited is where I found the Sunkist Pineapple. A week or so later, I found a dusty 12-pack of Big Red soda, alone on a shelf. I was giddy. 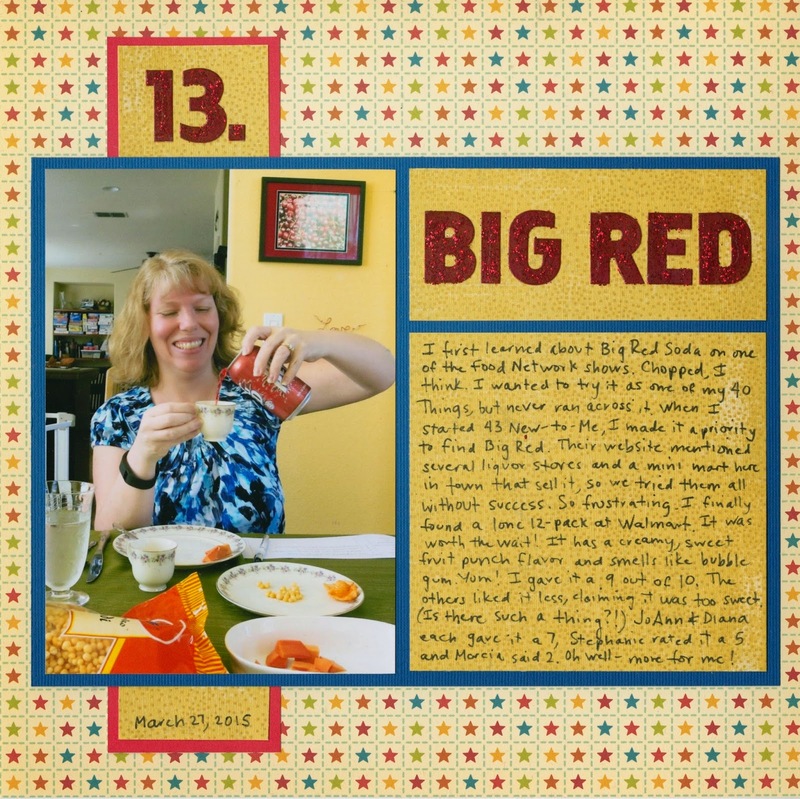 My teaching coworkers were coming over just days later, so we'd try Big Red together then. I poured it from the can (wow- it's REALLY red) into dainty teacups. So how was it? Delicious! Well, I thought so anyway. It was fruity and sweet and creamy and yum. It smelled like bubblegum, but tasted like a mix of fruit punch and cream soda. It was almost sickly sweet, which is not a bad thing in my world. As far as I'm concerned, there's no such thing as too sweet. Some of my friends disagreed. No problem- more for me! 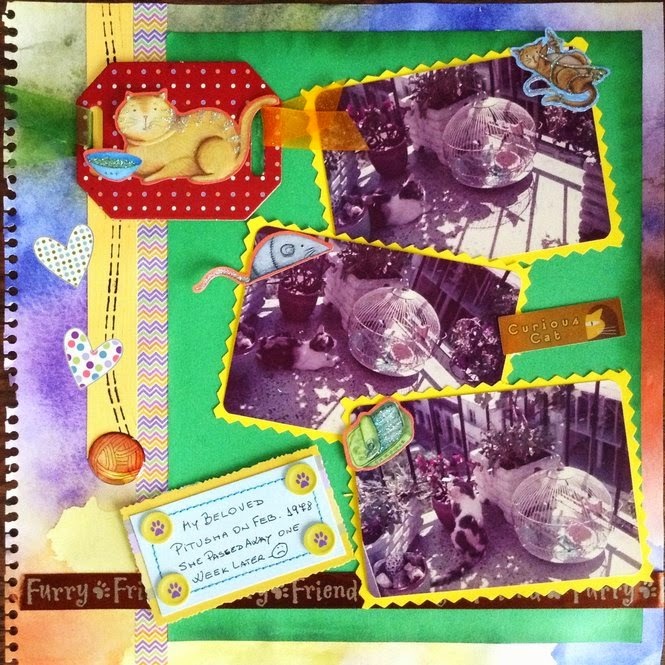 I enjoy listening to podcasts, particularly scrapbook-related ones, while I'm doing chores. 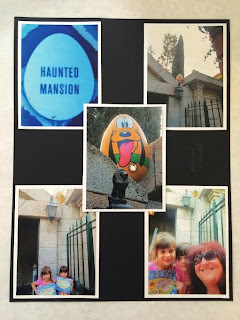 Sadly, of the four scrapbook-related podcasts I mentioned in a March 2014 post, only one remains. Fortunately, it was my favorite of the four. 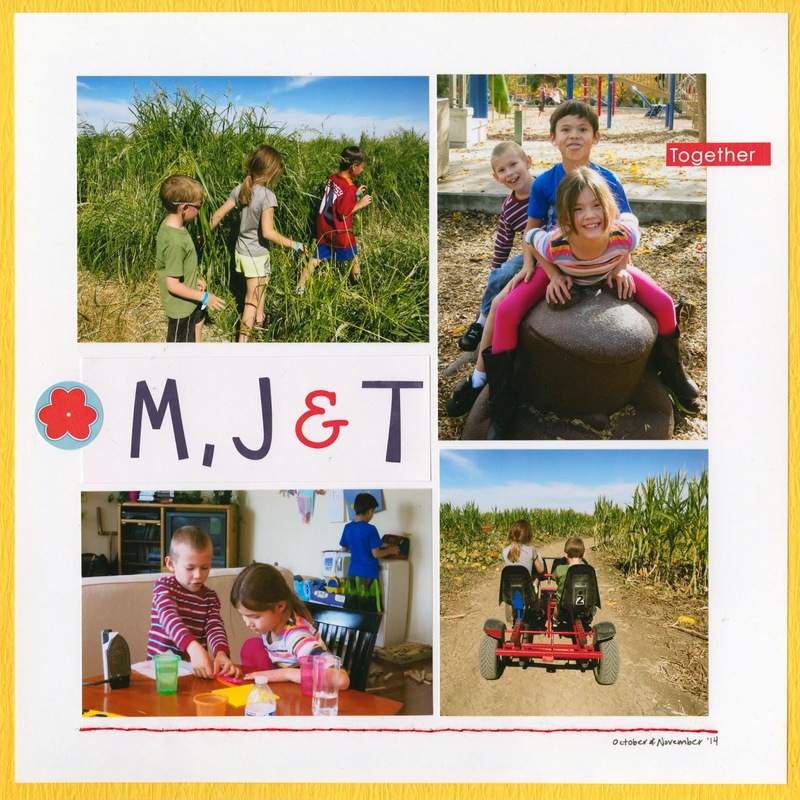 I do listen to podcasts other than scrapbooking ones, such as the foodie-favorite Spilled Milk, Julie Fei-Fan Balzer's Adventures in Arting, Katrina Kennedy's photography-related Capture Your 365, and, of course, the outstanding Serial. But I was in the market for another great scrapbooking podcast. I did some Googling and came across The Scrap Gals. After listening to the most recent episode, I was hooked. I went back to the beginning (which, oddly enough, is Episode 2, not Episode 1) and started binge-listening. One of my favorites was Episode 14, "Scrapbooking on a Desert Island." 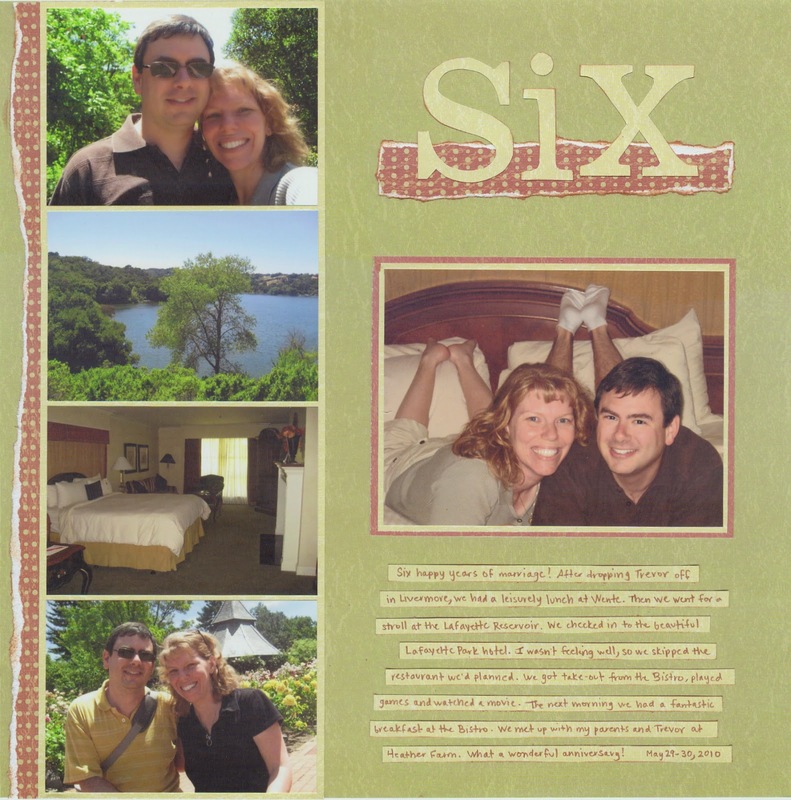 Tiffany and Tracie each chose the limited scrapbook supplies they would bring if they were stuck on a desert island. As I was listening, I started making a list of my own answers with plans to leave a comment. But after a full page of notes, it was clear that I had a blog post on my hands, not a mere comment. I won't go through what Tiffany and Tracie chose to bring with them to the hypothetical desert island, as you can listen to the podcast and hear for yourself. Instead, I'll share my own pick for each category they discussed. If I could only scrap with one manufacturer for the rest of my life, it would be Echo Park. 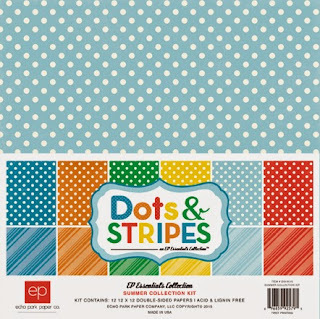 I own most of their Dots & Stripes papers and use them frequently as backgrounds or accents. 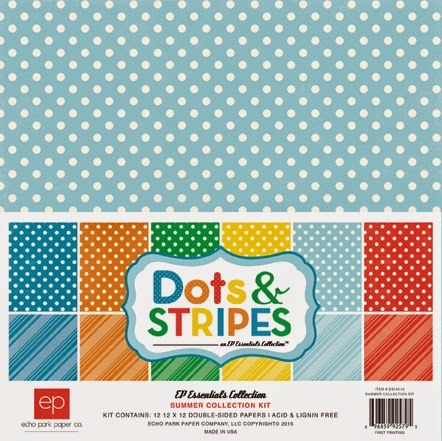 Tiffany and Tracie split their answers between 12" x 12" and 6" x 6" paper pads, but I'd still choose Echo Park's Dots & Stripes regardless of size. I'm a Bazzill loyalist. I love their color and texture options and the quality is second-to-none. I don't do pocket-style scrapping and have never bought products intended for Project Life or related systems. I've been given some product from various manufacturers that I've used here and there, but I haven't used any enough to form opinions. 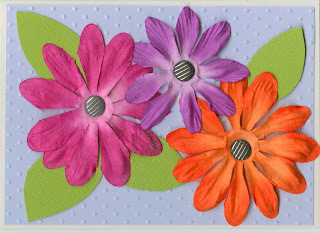 I have a very minimalist style and don't use a lot of embellishments. I'm very particular about what I use as embellishments - they can't be too large, they can't add bulk to a page and they have to actually make sense with my page. Some people think nothing of putting an owl, or an anchor or a bicycle accent on a page, but I am such a literal person that I would have to actually be scrapping about owls, sea travel or cycling to use any of those. Consequently, I don't buy a lot of embellishment packs, since 99% of them aren't relevant to my scrapping. I do use stars, arrows and hearts fairly often. 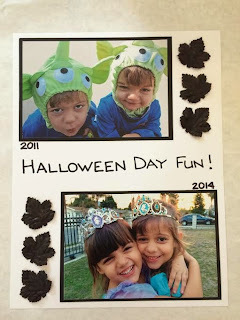 I also use a lot of holiday- or birthday-themed embellishments. Some of my favorites are the Icon Stickers by Simple Stories. 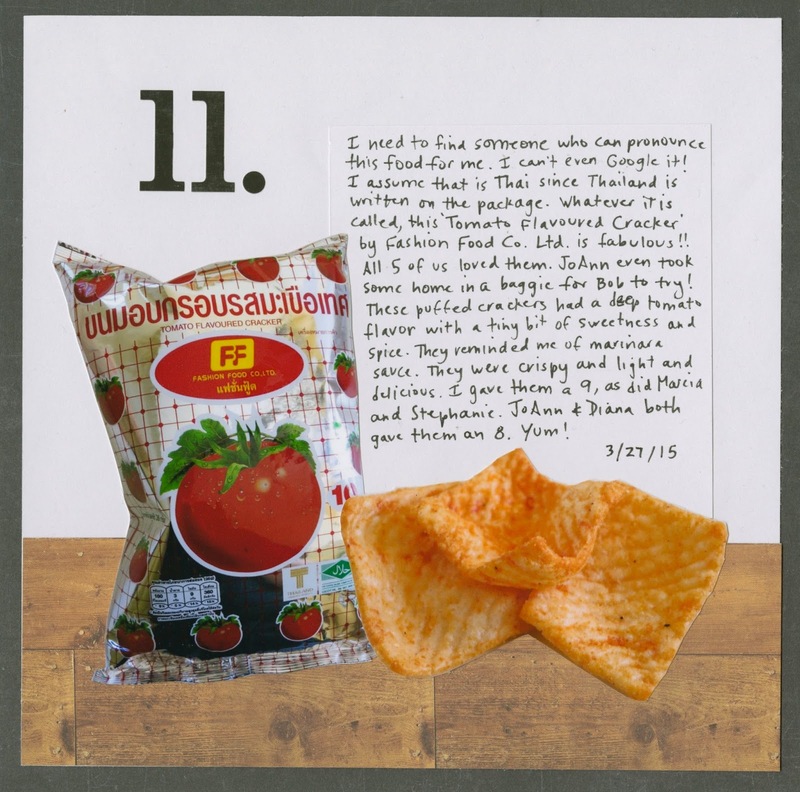 I'm obsessed with Simple Stories letter stickers and would definitely sneak them into my desert island packing, but I'm going to have to give the official win to Jillibean Soup Beanboard Alphas. Technically they are not stickers, as they don't have adhesive, but they're still my vote for best letter stickers. 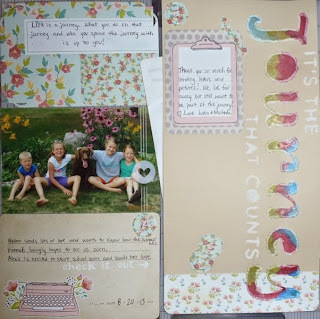 They have everything I love about chipboard letters without any bulk. Tiffany and Tracie lumped adhesives and journaling pens into their tools selection, but I need dedicated categories for those. My #1 dry adhesive is Tombow Mono. My favorite wet adhesive is Martha Stewart Glittering Glue. 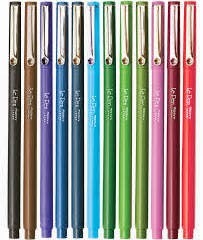 My favorite journaling pens are Marvy's Le Pen. I have to mention my favorite ink, too. It's ColorBox Chalk Ink, in Chestnut Roan. Now, on to what I actually consider must-have tools. 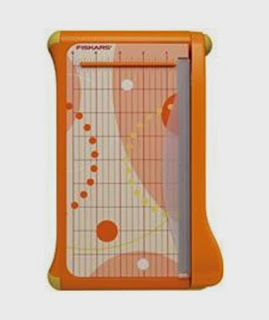 I love, love, love my Fiskars Bypass Trimmer. I'd need to bring along a larger trimmer for my 12" x 12" paper. I wish this one came in a 12" x 12" version. I can't tell you how much money the words "self-sharpening" have saved me over the last decade or so. Finally, my beloved Fiskars Microtip Scissors. I love them so much I made a layout about them. And that concludes my desert island packing list! What would make onto your list? I'd love to hear! I *finally* made a layout with photos from my experience as a studio audience member for Lain Ehmann's CreativeLive workshop called 'Scrapbook Your Story.' It's appropriate that I'm sharing it today, since it's been exactly one year since that day that started out so wrong and ended so right! I'm really happy with the layout. 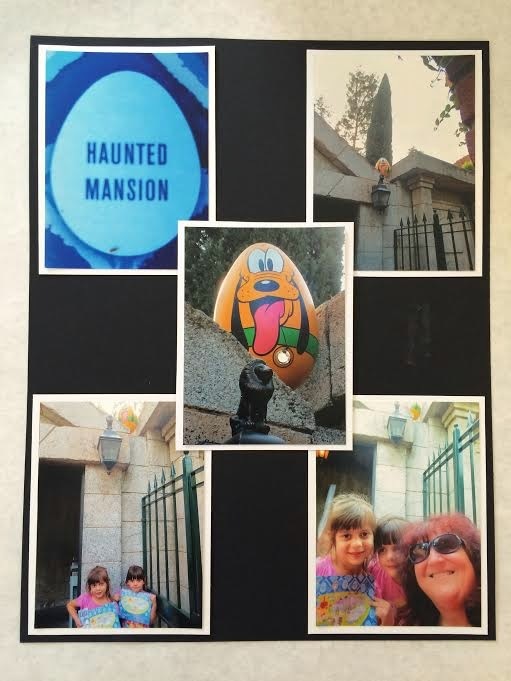 So many wonderful memories! 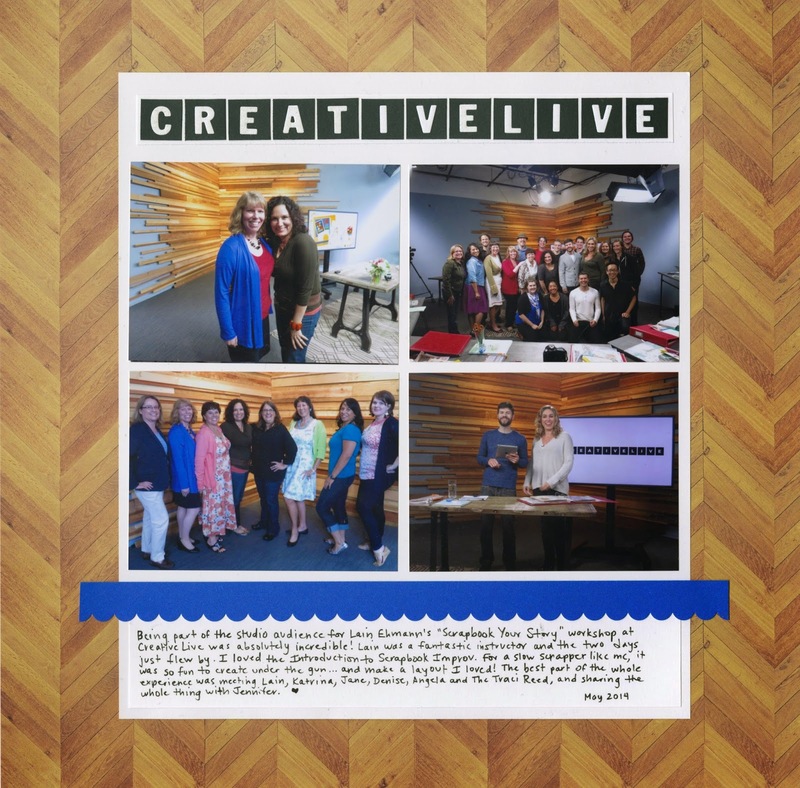 After this experience, I am a huge fan of CreativeLive and of Lain. If either is not familiar to you, go check out both! You won't be disappointed. 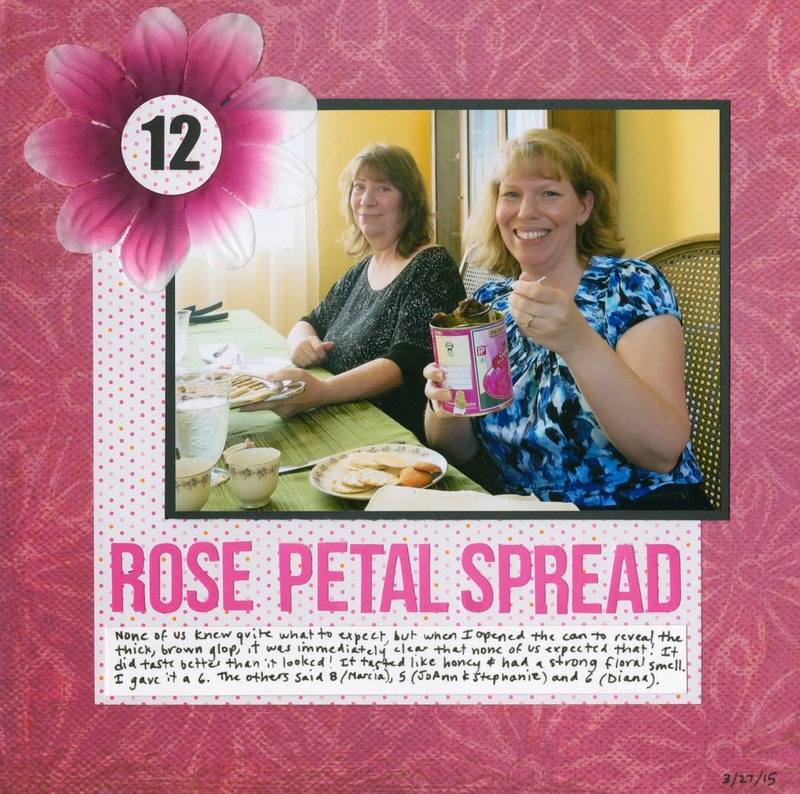 I was giddy when I found a huge can of something called "Rose Petal Spread" at an Indian market. I've had rose water, rose hip tea and have eaten rose petals decorating a fancy plate, but I'd never even heard of rose petal spread. That's exactly the kind of food I wanted to try for my 43 New-to-Me birthday challenge. NOT what any of us were expecting! The label was pink and pretty, like roses. The actual product was brown and gloppy, not at all like roses. Fortunately, this very ugly food smelled and tasted much better than it looked. It reminded me of honey in a lot of ways. It was very sweet and extremely floral. It was pretty good on the crackers, but way too much with the Nillas. I gave it a 6. The others rated it a 5, 5, 6 and 8. 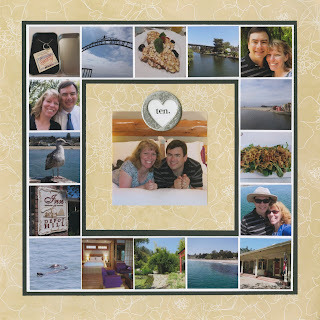 The tenth and final National Scrapbook Day challenge was to use a stencil, exactly one photo and two or more punches. 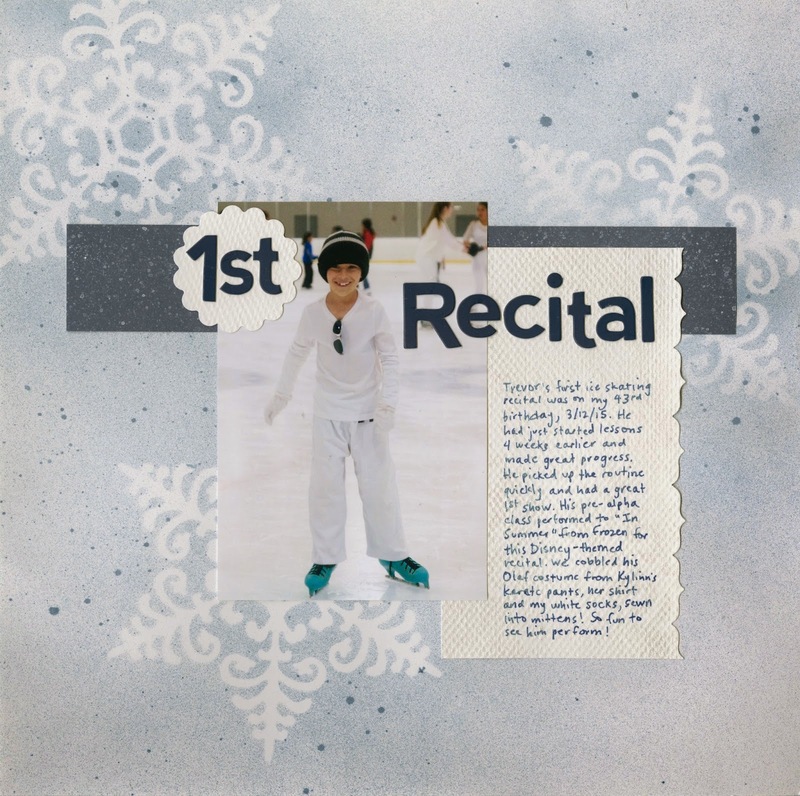 I decided to scrap a photo from Trevor's ice skating recital. 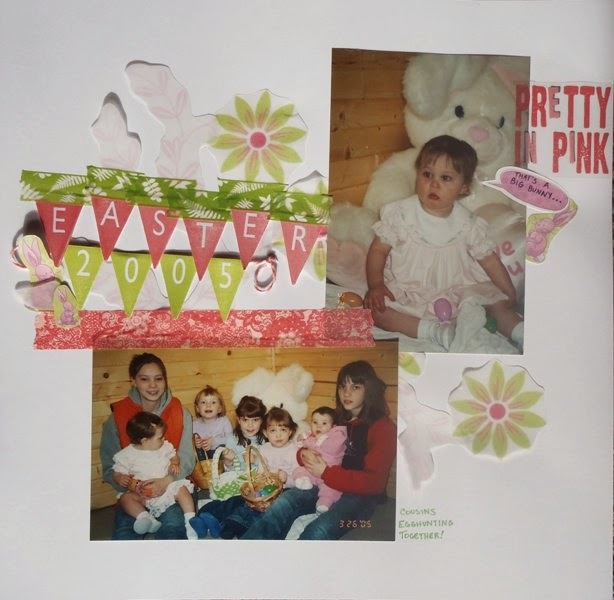 I used a Tattered Angels snowflake mask and Glimmer Mist to make a background. 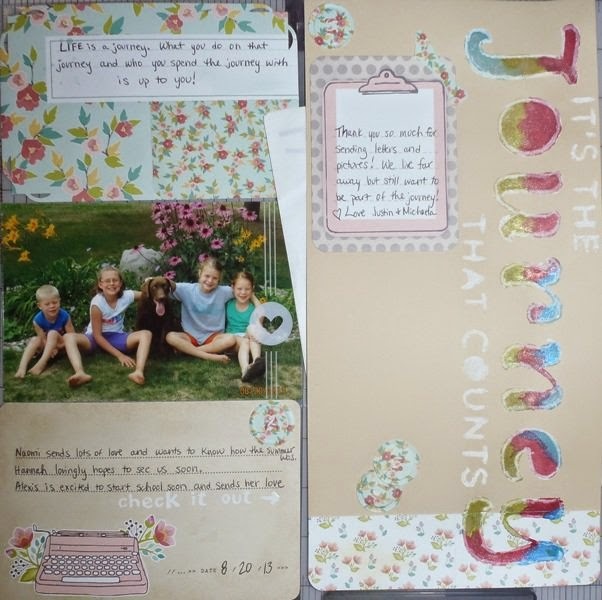 I used a border punch to make a journaling spot and a scalloped punch to hold the "1st" part of the title. Two other scrappers played along with this challenge. Aren't their layouts pretty? Congratulations to you both! I'll get your prizes to you right away. Thanks so much to everyone who played along with my online crop! 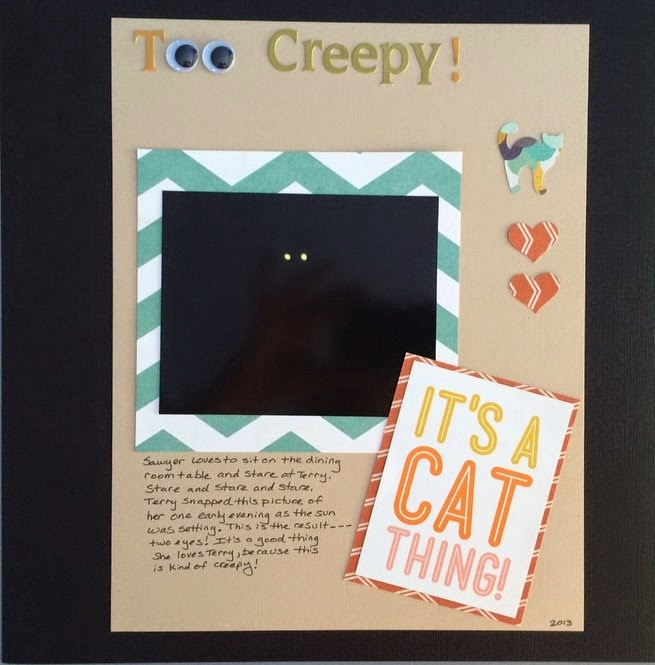 The ninth challenge for National Scrapbook Day was to make a project incorporating an animal, chevron and at least two hearts. Obviously, I chose to scrap some cute photos of Trouble. I decided to focus on his ears. It is absolutely amazing to me how much he is able to communicate with those ears of his. I can tell at a glance if he is relaxed, curious, annoyed, or confused. 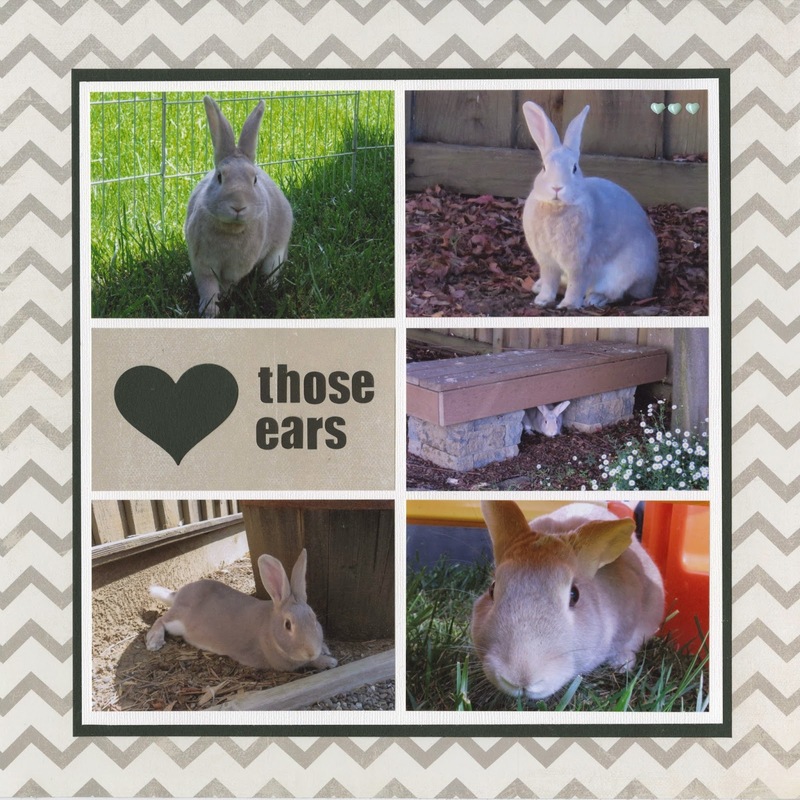 I chose five outdoor photos with his ears in different positions, a grey chevron that matches his fur, and one large paper heart and three small enamel hearts. Two scrappers played along with this challenge, both with pages about a cat. Click on the links below each to visit their galleries and read more about their projects! 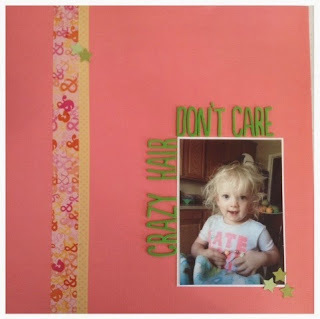 One final NSD challenge to share! 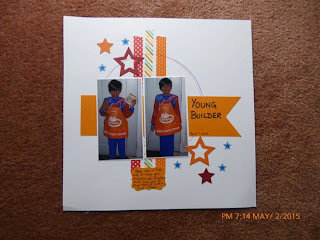 The seventh National Scrapbook Day challenge was to make a project with washi tape and 3+ stars, but no patterned paper. Last Thanksgiving, I'd taken a photo of Trevor, Steve and my father-in-law Dave together. As I was prepping for NSD, I came across a photo of the three of them in the same positions in 2006 and knew I had an awesome then-and-now page to make. I matted the photos on black cardstock, then added cream cardstock pieces with a strip of star-covered washi tape and the title. 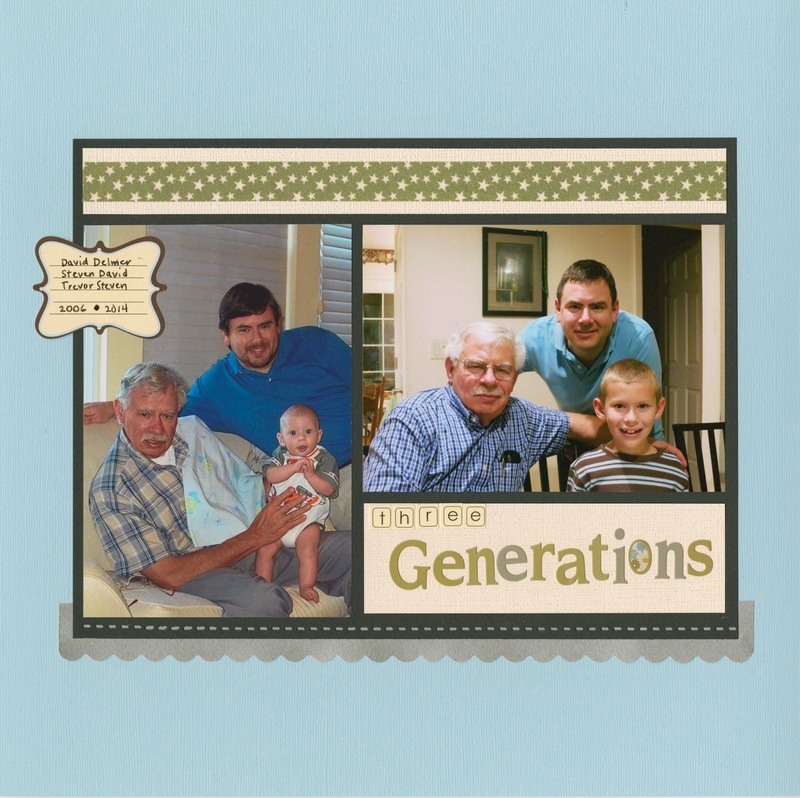 I punched a border of silver vellum and chose a blue cardstock base. I added a quick journaling sticker with their names. A fun fact about their names. I've mentioned this once before, but in Steve's family, the boys are given their father's first names as their middle names. Thus, David Delmer, Steven David and Trevor Steven. Two scrappers played along with my challenge. Apparently great minds think alike, as washi tape is a great way to add patterns when patterned paper is forbidden! Thanks to you both for playing along! Three more challenges to go before I announce the winners. 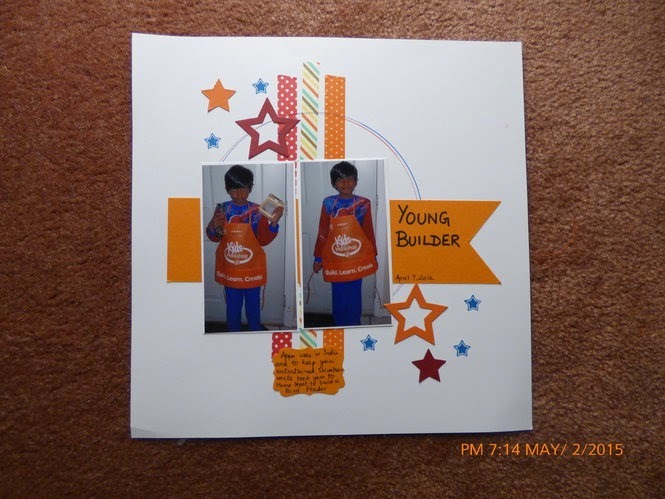 The sixth National Scrapbook Day challenge was to combine stripes, chipboard and a large circle on a project. 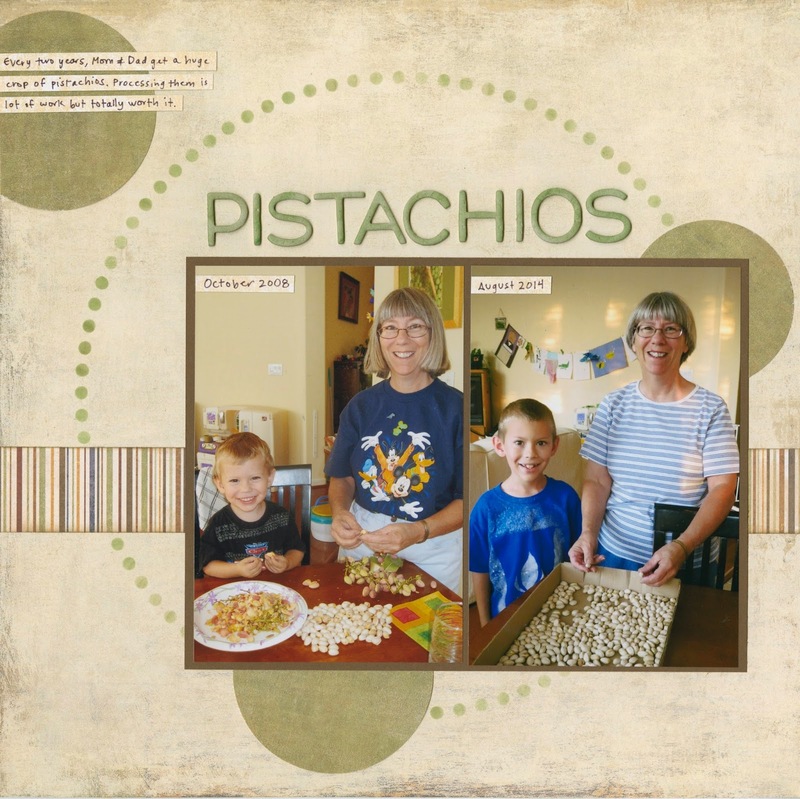 I made another Then-and-Now layout with pictures of Trevor and my mom processing pistachios in 2008 and again in 2014. It's something we do every other year (more about that here). I used a stencil to make a dotted circle, added a strip of striped paper, and then inked raw chipboard letters with the same ink I used on the dotted circle. 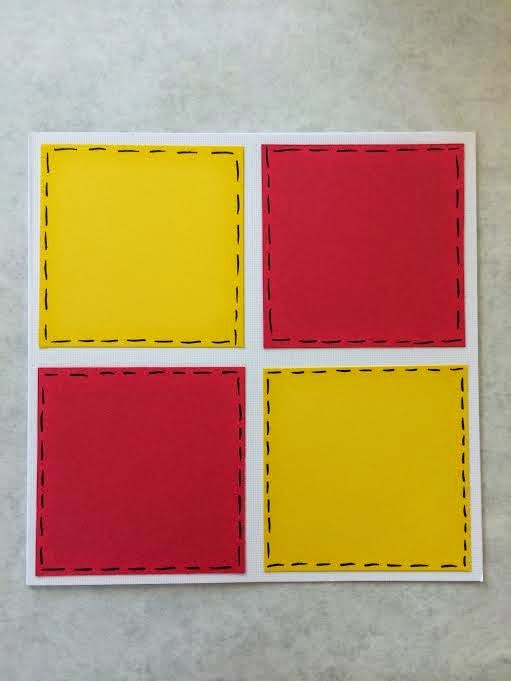 I punched three smaller circles to guide the eye and house my journaling. One scrapper played along with this challenge. 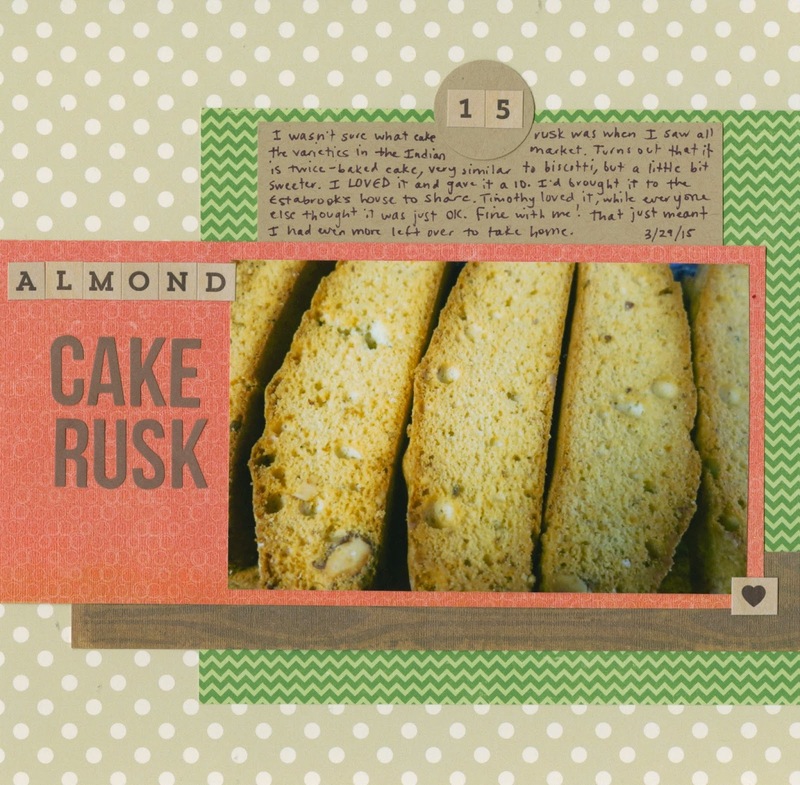 I absolutely love her layout that combines her son's photo, artwork and writing. I never would have thought to use a self-portrait as a large circle! It's fabulous. 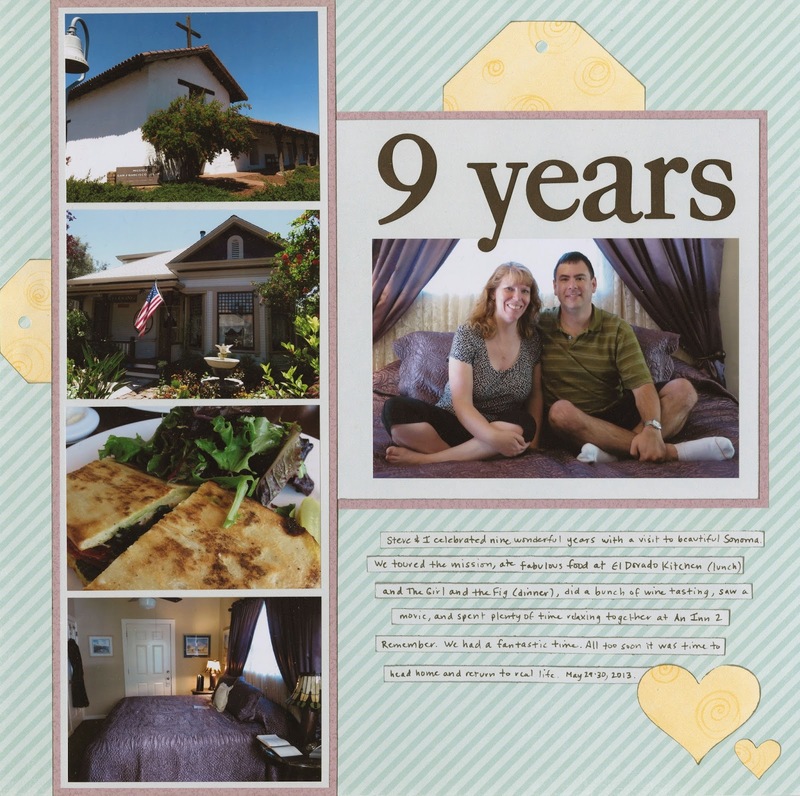 Coincidentally, I have another then-and-now layout to share tomorrow. I didn't complete the challenges in order, so I hadn't realized that there were two back-to-back. Happy Mother's Day to all you moms out there! 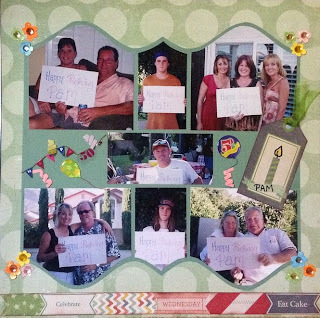 While I was cleaning out my scraproom for National Scrapbook Day, I came across the gift Trevor made for me Mother's Day 2014 that I never shared. He made this at school. 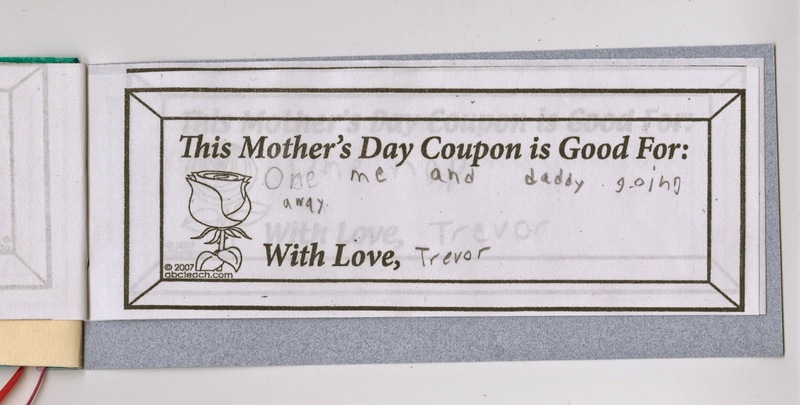 It's full of all sorts of coupons for a variety of chores, such as making dinner. "One me and daddy going away." I redeemed that one on National Scrapbook Day. I definitely need an empty house in order to finish 10 layouts in one day! Today we're planning a museum visit and a BBQ with Steve's parents. It should be a lot of fun. I hope all you moms out there have a great day planned. And a special Mother's Day wish to my own mom! You're the best. The fifth National Scrapbook Day challenge was to combine stamping, triangles and speech bubbles on a project. Of the ten challenges, this was the hardest for me. 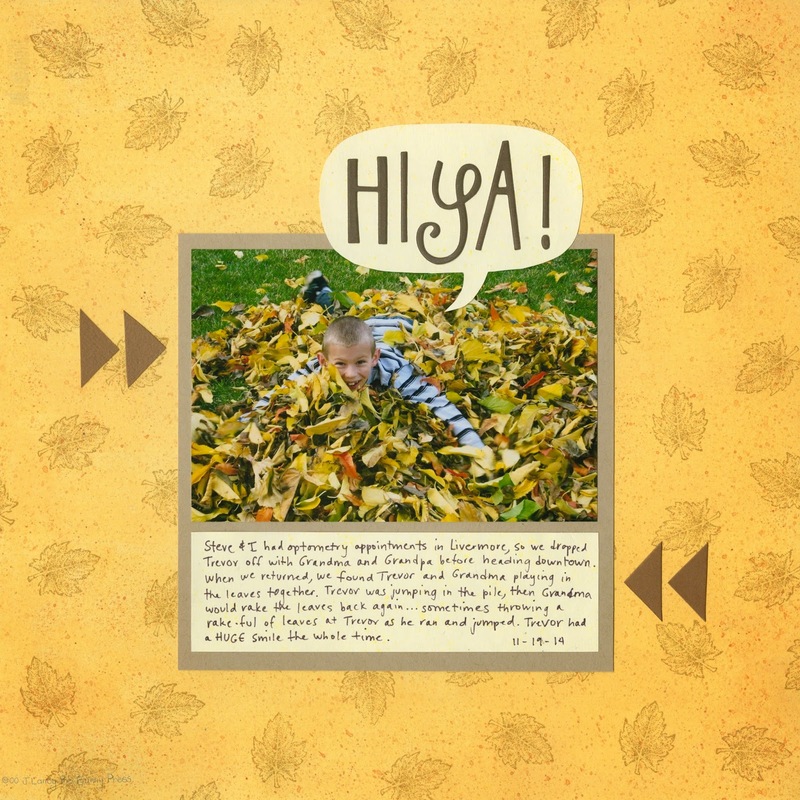 I really struggled to find a photo that would work with a speech bubble before settling on one of Trevor leaping into a pile of leaves with a loud, "Hiya!" 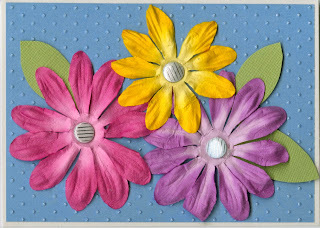 Once I chose that picture, I stamped a leaf background on an ancient piece of speckled orangey-yellow patterned paper. 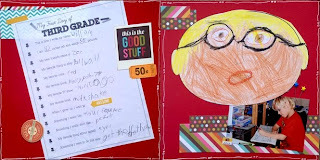 I added cardstock triangles pointing toward Trevor's face and the journaling to form a visual triangle with the title in the speech bubble. More about that patterned paper. Just how ancient is it? Well, if you look closely, you can see that printed on the FRONT of the paper is the date and copyright info (00 J. Lanoy Bo Bunny Press). So it's 15 years old. I can't fathom why any company, even fifteen years ago when the scrapbook industry was newish, would print copyright info on the patterned side of the paper. It's on the back as well, so it wasn't a matter of saving money by only printing on one side. I almost didn't use the paper because it bothered me so much. I tried to cover it, but then decided to just not worry about it. I'm really glad that manufacturers stopped that terrible practice! One scrapper played along with this challenge. Cute, isn't it? 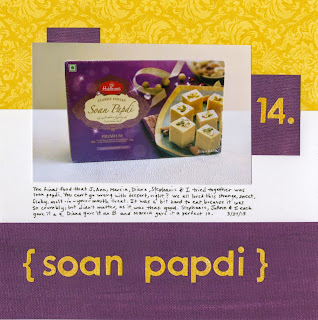 Next week I'll be sharing the last five challenges and will announce the lucky winner(s). 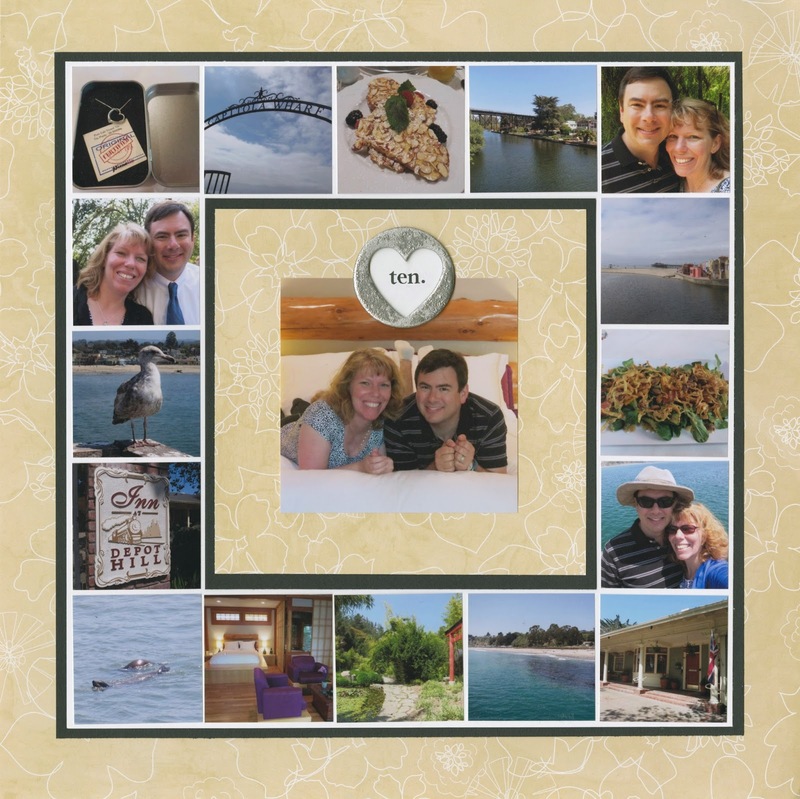 The fourth National Scrapbook Day challenge was to make a layout with at least five photos and some sort of bling. 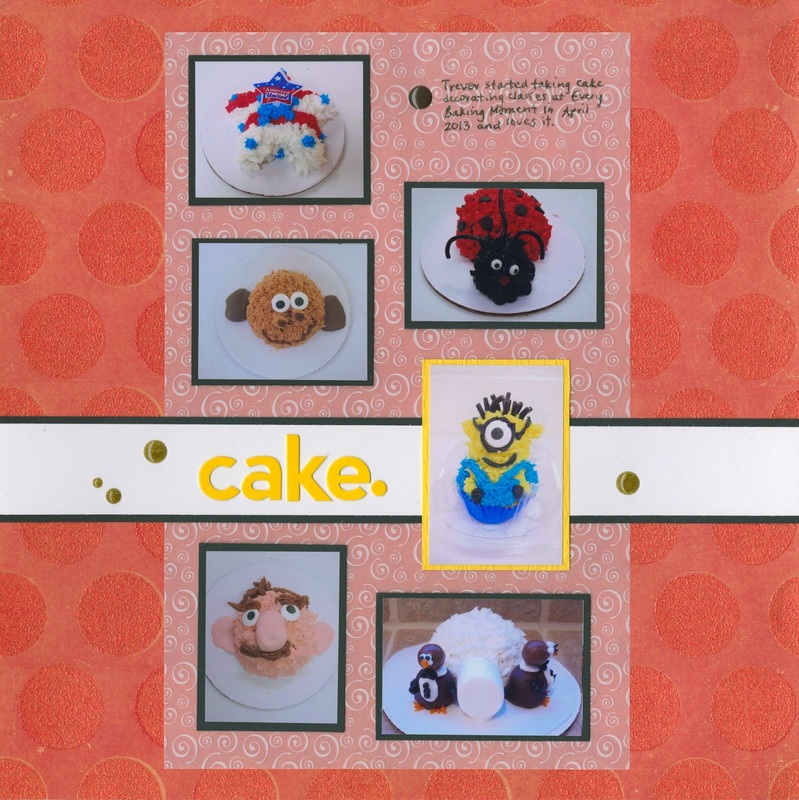 I made a layout using some of the photos from Trevor's cake decorating classes. The background paper has glitter polka dots and I added sparkly gold enamel dots as accents. That's about as blingy as I get! Three others played along with this challenge. 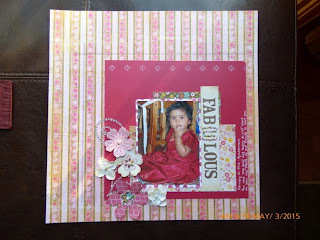 It's so fun to see how others interpret a challenge and how each crafter's style influences her decisions. 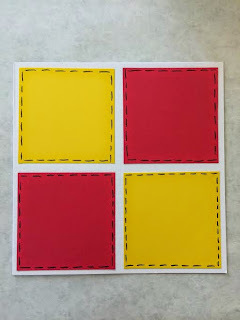 The third National Scrapbook Day Challenge was to make a project using only primary colors and to incorporate stitching. I made a simple layout of Trevor with his friends, Marco and Julia. They are the children of my childhood next-door neighbor and best friend, Nancy. Even though we now live 1000+ miles apart and only see each other once a year or so, the kids always pick up immediately as if no time had passed. Susan was the only person who played along with this challenge. She made this simple, pretty card. Actually, I know of two others who played along but weren't able to finish until after the deadline. I don't know why, but it seems like there are always at least a hundred other things scheduled for the first Saturday in May. That's why I always put NSD on the calendar at least a year in advance. Nothing gets in the way of NSD for me! 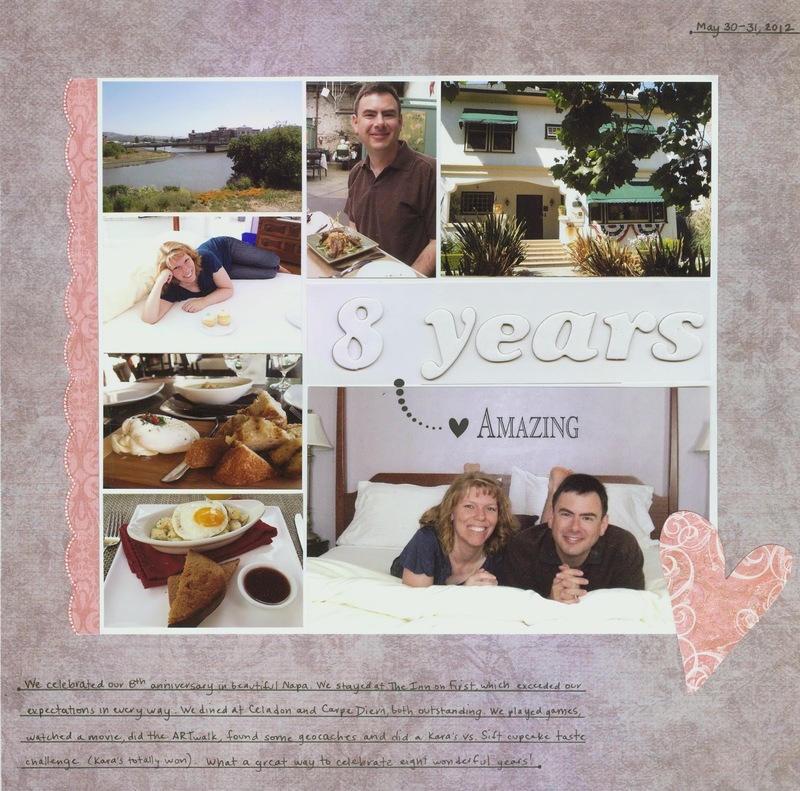 As always, huge thanks to Steve for supporting and accommodating my scrapbook obsession 100%. 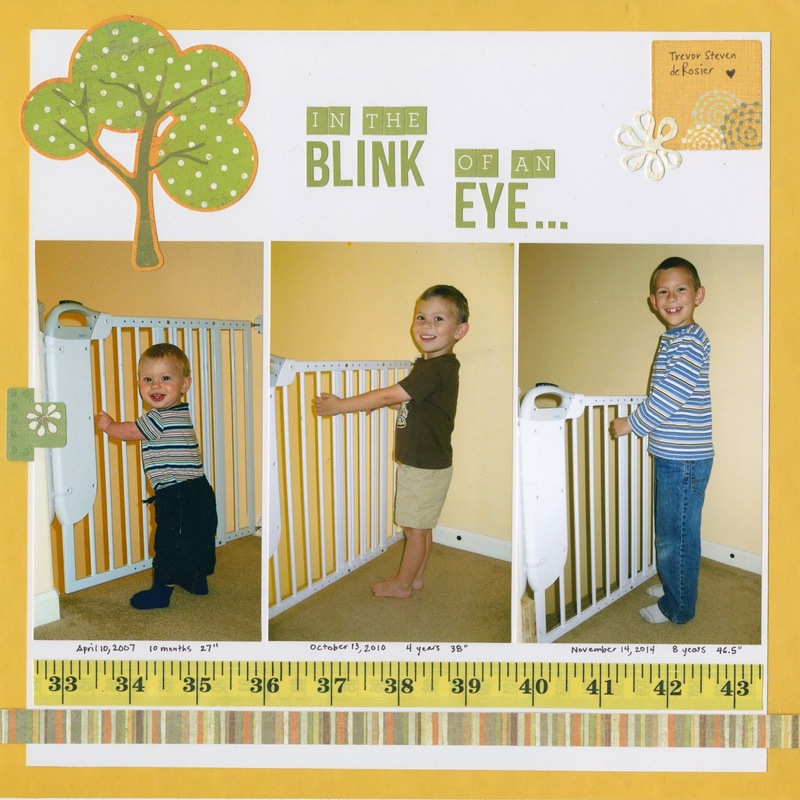 About four years ago, I made my very first then-and-now layout (here) using the first two photos of Trevor by the upstairs baby gate. 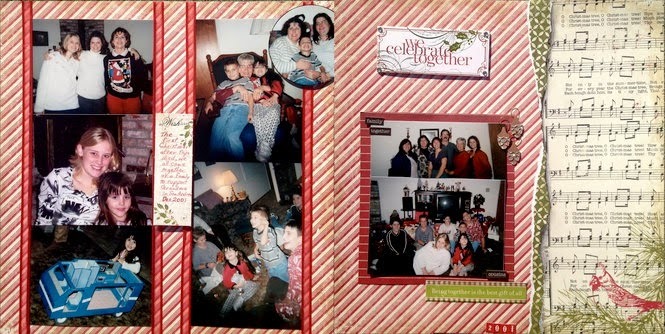 I wanted to make another layout with those photos and include a more recent photo too. I can't believe how big he is getting! Almost 9. Where does the time go?! Two women played along with my challenge. I love both of their layouts! Then-and-now pages are probably my absolute favorites. In fact, I love then-and-now layouts so much that I ended up doing two more on National Scrapbook Day! I'll be sharing those soon.